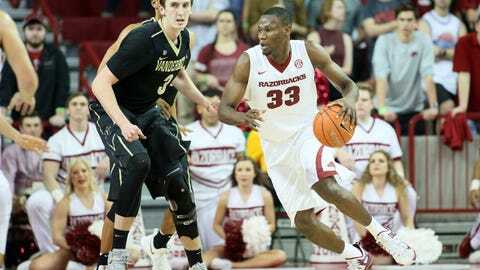 Arkansas men’s basketball team loses what was a must win against Vanderbilt. The Arkansas basketball team and their hopes for the NCAA Tournament fall to Vanderbilt 72-59. “We turned a chance for a comeback into a setback,” said Arkansas’ Dusty Hannahs in his post-game press conference. There’s no real better way to say what happened tonight. Except for maybe when he said, “It was just one of those train-wreck type of games.” Arkansas was coming off of a loss to a terrible Missouri team and should have been fired up and ready for a fight tonight. The reality was much different. Arkansas looked gassed from the tipoff to the buzzer. Not just physically tired but also emotionally and mentally exhausted as well. The only player tonight that really left it all on the floor was Hannahs. Dusty tried his hardest to keep his team in this game. His 24 points and 5 rebounds didn’t come easy. He shot 3-6 from the three and tried countless times to drive the lane and get the whistle blown but it was in vain each time. Hannahs ended up only shooting two free throws the entire night. What makes this worse is that this isn’t even the Vanderbilt team that Arkansas has already beaten at their own gym. The Dores were actually missing their leading scorer Matthew Fisher-David. It was announced before the game he hadn’t made the trip for a “violation of policy. Want your voice heard? Join the Razorbackers team! I’ll be writing a piece focusing the team as a whole tomorrow but tonight was hard for the team and the fans. Dusty Hannahs also said in his post-game presser, “We haven’t given up. I want everyone to know that.” The question is, is it too late?